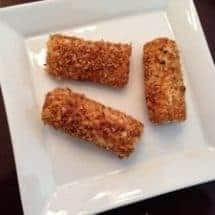 Most of the recipes I see for cheese sticks are heavily breaded and fried. So we did these with panko breadcrumbs to get a light coating, and they turned out very well. The kids enjoyed them too. Great appetizers but best eaten hot. Open string cheese packages and cut cheese into two even pieces. Put bread crumbs, garlic powder and pepper in zip lock bag. Close bag and shake until well mixed. Spray fry pan with Pam oil and preheat on medium low burner. When pan is hot, pour bread crumb mixture into pan, and stir often until crumbs are a golden brown, about 8 minutes. Don't skip this step. We tried it without toasting them, and they tasted undercooked. Pour crumbs into bowl and let cool. Whisk egg until well mixed. Dip a piece of cheese into egg mixture, roll in bread crumbs and place on baking pan. When all cheese is coated, place pan onto middle rack of oven and bake for 10 minutes. Remove, let cool until very warm and eat while warm.